The Zonta Club of Hornsby Ku-ring-gai supports the service projects of District 24 and donates to the Zonta International Foundation’s biennial service goals. We also pursue local service interests that meet the objectives of Zonta. Our club has been making Zonta Breast Care Cushions since 2004 for the Northern Sydney Local Health District. Cushion making materials are purchased through grants from the Turramurra Community Branch of Bendigo Bank. 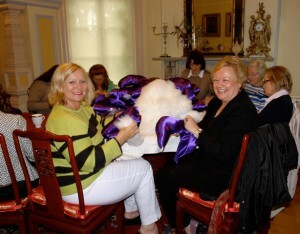 Volunteers from our club and the community sew and stuff over 200 cushions each year which are distributed to patients through Breast Cancer Care nurses. Since 1992, we have been recognising and encouraging our future female leaders through the Young Women in Public Affairs Award. The programme is well supported by our local schools. Applicants consistently demonstrate a high standard of community service, an awareness of women’s issues and offer inspiring suggestions for improving the status of women. Three of our Club winners have gone on to be awarded the prestigious Zonta International YWPA prizes. We hold a variety of events throughout the year, inviting interesting guest speakers to inform us and raising funds to support local women’s causes. Follow us on Facebook to see what we have been doing recently.